We all remember what happened back in September of 2009. In perhaps the worst start to a season (and a new era under head coach Chip Kelly) imaginable, the Ducks’ nationally renowned offense was held to 152 total yards in a 19-8 loss to Boise State. Things only got worse after the game, when stud running back LeGarrette Blount answered a Boise State player’s taunts with a right jab, leading to Blount’s suspension from playing in games for nearly the entire season. Duck fans were left speechless. An ugly loss to a hated rival on their painfully outlandish blue turf in the first game under a new head coach? Fans wanted their money back. Literally. One season-ticket holder sent a letter to Kelly requesting a refund for his trip to the Boise State game. The fan was left stunned when Kelly actually replied with a check for $439, the exact expense of his trip. The night really was darkest just before the dawn. 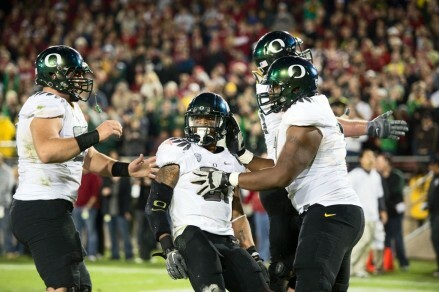 Running back LaMichael James played a key role in Oregon’s four-year BCS Bowl streak. Though Blount was dearly missed, nobody could have predicted that his absence would give birth to arguably the best running back the conference has ever seen, in a certain LaMichael James. On September 3, 2009, nobody would have guessed that Chip Kelly would go on to win back-to-back Pac-10 Coach of the Year honors. And not even Duck fans could have anticipated Oregon’s three straight Pac-10/12 championships and four straight BCS bowl berths through 2012. Despite Oregon’s recent accomplishments and a 46-7 record over the last four seasons, many fans, coaches, and analysts (especially in SEC territory) remain unconvinced that the Ducks belong among the top programs in the country. Constant arguments surrounding their “gimmicky” unconventional offense, “weak” schedule, and poor big-game performances have dampened the Ducks’ national reputation even during one of the best runs in college football history. However, history proves that Oregon’s BCS bowl four-peat makes our modern Ducks one of the most elite squads ever to take the field. Since the dawn of the BCS era in 1998, only four teams have traveled to four straight BCS bowls. Besides the 2009-2012 Ducks, the other three were Miami (2000-2003), USC (2002-2008), and Ohio State (2006-2011). Even Nick Saban’s current Alabama Crimson Tide, which has won the national championship in three of the last four seasons, missed out on a trip to a BCS bowl in 2010. Now, comparing Oregon to the other three teams that have accomplished this feat, it is quite obvious that the Ducks belong at the top of the list with some of the best college football teams in BCS history. This can be seen by the amount of players now in the NFL from each of these past three dynasties. During their seven-year run, 51 USC players were drafted into the NFL (7.3 per year). Ohio State had 36 future-NFL picks from 2006 through 2011 (6 per year), and Miami had an astounding total of 35 players drafted during its four-year streak (8.8 per year). 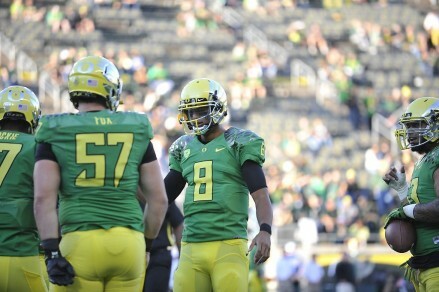 As for the Ducks, they have had only eight players drafted into the NFL over the last three seasons (2.6 per year). This is not a knock on Oregon compared to those other teams. On the contrary, it is a testament to the Ducks’ outstanding strategy and team play. The Ducks have been cruising to victory with far less traditional NFL talent than Miami, USC, and Ohio State did during their runs. Many consider Miami’s 2001 squad to be the greatest college football team of all-time, an idea supported by the roster’s 15 future first-round draft picks. That year, the Hurricanes’ average margin of victory was a dominant 34 points. In comparison, the 2012 Ducks averaged 49.6 points per game, allowing only 21.6 points per game, giving them an average margin of victory of 28 points. While this four-touchdown margin is truly incredible, it does not quite match that of Miami in 2001. However, something to consider is the fact that, save for the USC, Stanford, and Kansas State games, Kelly pulled his starters early due to big leads, sometimes as early as the latter part of the second quarter. We should also not forget to mention the fact that, while every team has their fair share of injury woes, Oregon achieved its margin of victory without its defensive leader in John Boyett, and arguably the team’s best offensive lineman in Carson York; both of whom were lost for the season in the second week of the season. Had this not been the case, there is little doubt that the Ducks would have exceeded that 34 point average margin of victory. While five Miami players were selected in the first round of the 2002 NFL Draft alone, only five Oregon players even received combine invites in 2013. Once again, this proves the fact that the Ducks are winning games by almost comically large margins with a relatively small amount of conventional NFL talent. If not for a fluky overtime to Stanford, the 2012 Oregon Ducks would have likely taken on Notre Dame for the national championship. Had they made it and won, it seems inevitable that they would be unanimously considered one of the best teams in the history of the BCS. Freshman quarterback Marcus Mariota will look to continue Oregon’s streak of BCS Bowl appearances in 2013.
each of them bursting at the seams with NFL talent and each of them considered elite in history. The Ducks are doing it without conventional NFL talent. They are doing it in the face of relentless doubt, condescension, and ridicule coming from all over the country. They are doing it definitively and efficiently. Many believe that the Ducks need to win a big game against an SEC defense to be considered an elite program. History proves, however, that four straight BCS bowl appearances makes the 2009-2012 Oregon program not only the most consistently first-rate current program, but one of the most consistently elite programs college football has ever seen. Even with the coaching change there is no reason to believe that the Ducks will slow down, either. 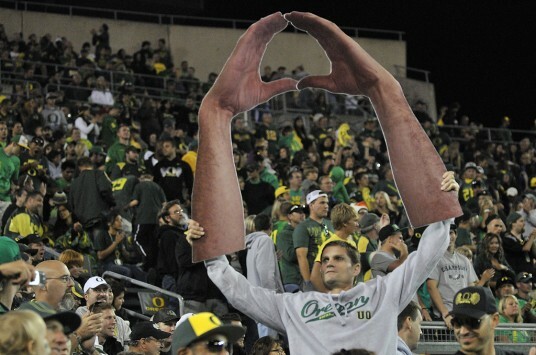 Kelly may be gone, but Mark Helfrich will ensure that Oregon continues to win the day. Who knows, maybe they’ll even extend their streak beyond that of Ohio State and USC.